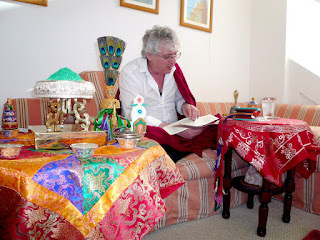 On Friday April 17th, Lama Jampa bestowed the initiation of Green Tara from the lineage of Shakyashribhadra on a small assembly of students from Mexico and Britain. The students had travelled there for the lama's teachings in Santa Monica, and having invited them to the house overlooking Malibu beach where he and his family were staying for the duration of their Los Angeles visit, the lama carried out the ceremony in full and then gave the reading transmission (lung) for the sadhana composed by Sakya Pandita. The ceremony was concluded with a dedication of merit prayer, recited by all with the aspiration of helping the Sakya dharma grow in both Mexico and the USA.